When I started teaching cows to eat weeds, I thought everyone would see what I saw: an economical alternative for weed management. If cows or other livestock eat weeds, you don’t have to spend money on herbicide or buy fuel for spray rigs or mowers. You don’t have to rent goats (sorry goat producers). And if you’re not interested in management intensive grazing, you don’t have to buy fencing equipment and set up any fences to get the cows to trample or eat the weeds. They just roam through pastures as they always do, adding weeds to their diets. Still, just because that’s what I see, doesn’t mean it’s obvious to everyone. I could even be wrong! So I consulted some economists and I asked ranchers I’d worked with what they thought. Then I put it all together in a video to share with folks who want to know. You can watch the video, or read below for a summary of what my consultants and ranchers told me. Reading on a tablet? Here’s your link. Economist John Morley noted that weed management is a huge problem. For example the state of Montana needs a 50% increase in its budget, from $20 million to $30 millon just to prevent weeds from expanding. North and South Carolina spent $250 million and could not eradicate weeds. 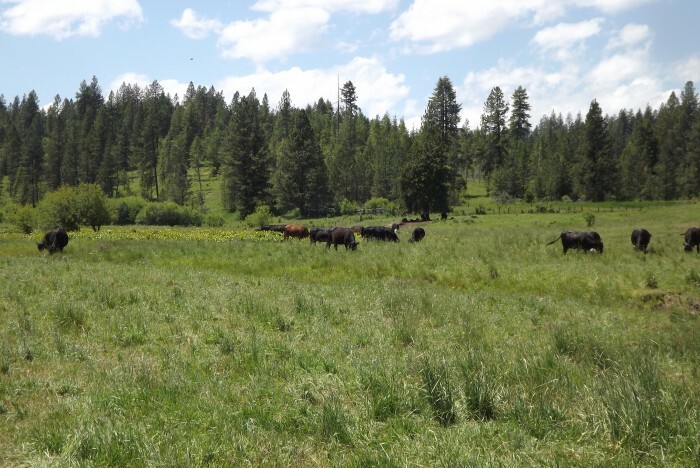 When he looked at a common infestation rate he determined that having weed-eating cows could increase acreage available for grazing by as much as 43%. I couldn’t have said it better myself! Eat weeds and have a good day! 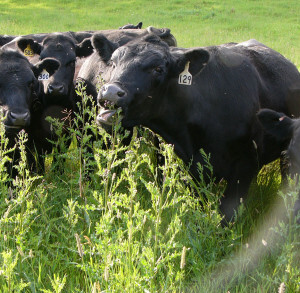 Want to turn your livestock into weed eaters? Kathy will help you, and you can pick your own price. Click here for more info. Via OnPasture.com | 43% Better – The Economics of Getting Your Livestock to Eat Weeds. Spring is in the air! Are new trees in your future? Spring is technically here, although yesterday’s snow storm makes you wonder about Mother Nature’s sense of humor! 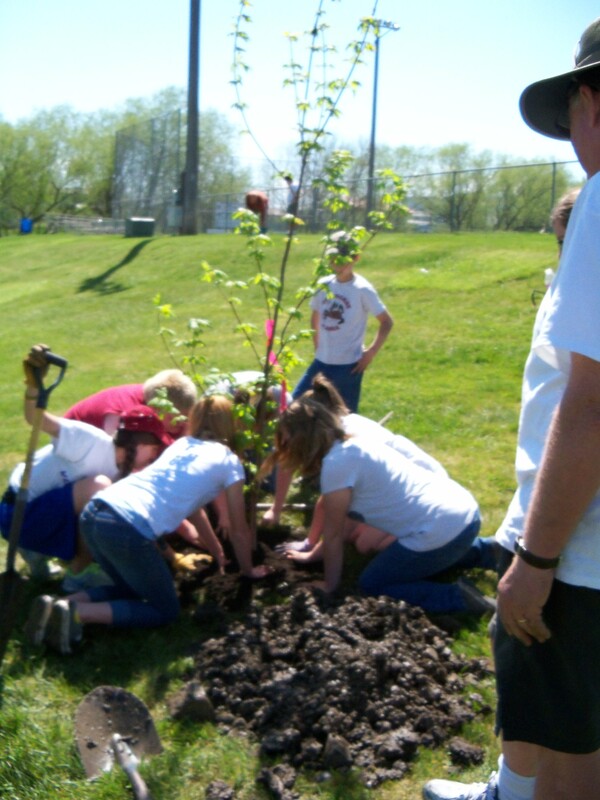 If planting new trees is on the “honey-do” list, here are some good articles that can assure success. ISWCD still has a few trees left from our Annual Tree Sales Program. Email Stefanie at Stefanie.hays@id.nacdnet.net to see what’s available. Did you know that the University of Idaho, College of Agriculture and Life Sciences (CALS) has an online library with information on almost any topic affecting North Central Idaho Farmers and Ranchers? We are all looking forward to the presentations at the upcoming workshop and, as a bonus, the Clearwater Valley High School Future Farmers of America will be providing lunch. Noon Lunch by CV FFA. Cost by donation. 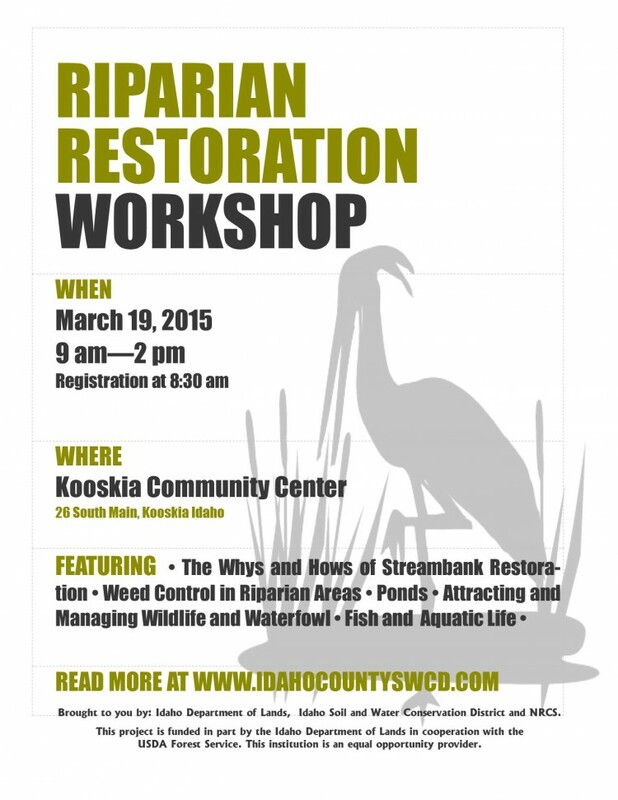 Idaho Soil and Water Conservation District, along with Idaho Department of Lands and Natural Resource Conservation Service, is hosting a Riparian Restoration Workshop on March 19, 2015 at the Kooskia (Idaho) Community Center. The workshop will provide to landowners information on streambank restoration, weed control in wetlands and riparian areas, and how to determine if a pond is a good addition to their landscape. Experts will also touch on topics that include managing and attracting wildlife and waterfowl to riparian areas and the benefits of restoration to fish and aquatic life. Information on funding opportunities will be available. 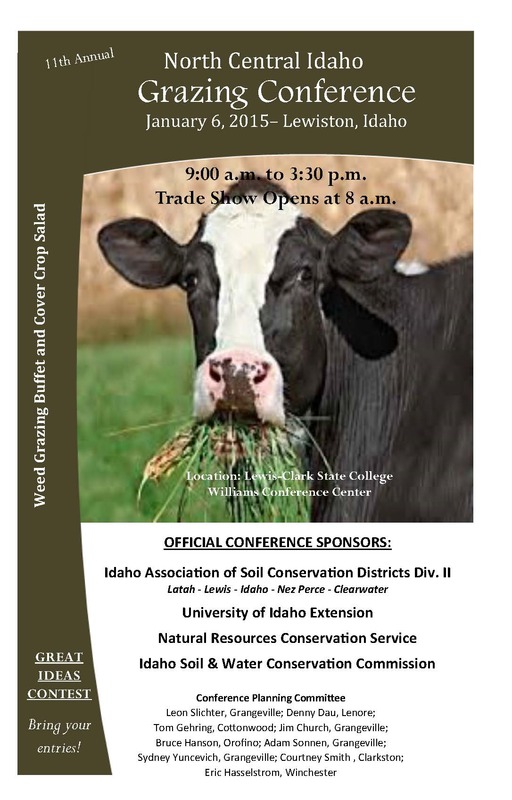 Mark your calendar for the 11th Annual North Central Idaho Grazing Conference in Lewiston on January 6, 2015. The conference will be on the Lewis-Clark State College campus in the Williams Conference Center . Doors open at 8:00 a.m., registration and check-in begins at 8:30 with presentations kicking off at 9:00. See the latest in Ag technology at the Ag Trade Show; hear from the experts on techniques for livestock grazing and noxious weeds; chemical and bio-control of annual grasses; plus producers’ perspectives on the benefits of cover crops and residue management. Registration includes the trade show and lunch. Pre-pay by 12/26/2014 for $15 or at the door for $20. The “Great Ideas” contest is running for the 4th year. Have you developed a product that aids in farm operations, livestock management or is just plain handy? Here’s your chance to win a $50 cash prize! Bring your handy gadget to the conference and show it off, the conference goers vote for their favorite and the winner takes home the prize. Private applicator pesticide credits (4) will be available. Certified Crop Advisor and Society of Range Management credits are in the works. For more information contact Stefanie at Stefanie.hays@id.nacdnet.net or call (208)983-1046 ext 3. Download the brochure here 15 Grazing Conf Brochure for more details and the mail-in registration. NEW!! – Register on-line and pay for 2015 Grazing Conference with PayPal!